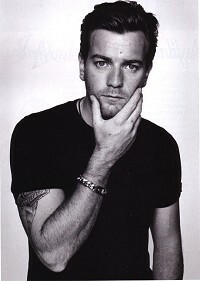 On screen, Ewan McGregor is one of the most transparent actors working today. His performance always seem effortless, whether it's an intense small-budget dramatic thriller like Young Adam or a big romantic comedy confection like Down With Love. You just never see those gears turning, and there's never a moment of starry scene-grabbing. So it's not surprising that in person he's utterly charming, looking you straight in the eyes with those dazzling blues as he answers your questions thoughtfully, talking a mile a minute. He's a bundle of energy in a white t-shirt and yeans, squirming in his seat as he talks, so lively, engaging and warmly hilarious that when the press officer appears and tells you to wrap it up, you have the urge to grab Ewan and escape out the back door, down to the pub for a pint and a good gossip. His new film, Scenes of a Sexual Nature, is a multi-strand British comedy with a tiny budget but a starry cast that includes Sophie Okonedo, Adrian Lester, Gina McKee, Catherine Tate, Hugh Bonneville, Eileen Atkins, Tom Hardy, Andrew Lincoln, Holly Aird and Mark Strong. McGregor stars in a segment opposite Douglas Hodge, as a gay couple struggling with the realities their long-term relationship. It's an unusually small role for McGregor, but at the time it was the perfect choice. After all those big movies, here you are earning minimum wage again. Yeah, but I suppose it didn't take me by surprise. If you want to work on good stuff, I think the worst thing you can do is set yourself up any kind of limits. I've tried always not to do that in terms of the characters I play. My choices are based solely on the script, the story, the writing and the characters, and never anything else. And that way you can have great variety and, as a result, great fun in your work. And second you can think, "I'm only going to make films in Hollywood or I'm only going to make independent films." But you're just giving yourself boundaries. "No boundaries" is the short answer. You were on stage in the West End production of Guys and Dolls when you made this film. In many ways it was wonderful, because by boyfriend in this story is played by Douglas Hodge - and on stage I was Guy Masterson and he was Nathan Detroit. We'd rehearsed together for six weeks, and we'd been on stage for a couple of months I think. So we had this great working relationship anyway, and then when we were sent the script - we were both sent it at the same time - we discussed it and thought it was a great scene. You know, everyone's story in this film is a long scene. And it was exciting to think that we'd be doing that together. And then once we'd committed to doing the film, we were able to work on it before we shot it. Because in our experience, 12 or 13 pages of dialog in two days is quite a tall order. So we thought the best way that was achievable was to have the whole thing down. And we didn't know whether Ed [Blum, the director] was going to cut it into sections or shoot it from start to finish. But since we'd done some work on it, we were able to start at the beginning of the scene and play it right through to the end. And that's in fact how we shot most of it. Most of the angles he set up were shot start to finish. It was more like theatre in that respect than anything else - it was great. Did you have any issues with doing a gay scene? I just wanted to play it as a scene between two people. I think the idea of playing gay is unhelpful. These are gay men in the scene, so that takes care of itself. I think you've just got to play the truth of the scene, and that makes you a gay man. I mean, what is a gay man? There are as many different types of gay men as there are straight men, you know. So I think we were just concentrated on the themes of it and the truth of it. I think the themes are quite particular to a gay couple - the idea of fidelity or infidelity has been part of the relationship. It would be a different scene if it was a man and a woman talking about the guy who's always sleeping around. However in the rules of their relationship, if you like, it's allowed, although it's causing Brian to be sad, you know. So that's their dilemma. And then I think the idea of wanting children would be very different if they were a man and a woman instead of two men. But then I thought these are just two people who are in love with one another, and it was important to make the relationship feel like it had been lasting for a long time, because they're supposed to have been together for 14 years. And I like to think we did. I wasn't aware of trying to be gay in it. I was just trying to play the scene, really. They're all different from each other, and I think that your job as an actor is to try and maintain the integrity of the scene regardless of the surroundings. It can be very tricky in a blue screen environment, but it can also be difficult when you're shooting on location on the street and there's paparazzi everywhere - and you want to kill the paparazzi - and you're still having to do your acting. You know, that's difficult too. So it's fair to say that it's all a challenge. But in this respect we had a very enclosed area of Hampstead Heath, so there were no worries about that kind of thing. We had privacy and we were able to just play the scene. And it was such a great scene to play because it was such a lovely piece of writing. I think we had two and a half days.